Summary of the project: I worked with the National Department of Health in Pretoria, South Africa to develop a week-by-week guide for HIV +/- pregnant women and their newborns. Sam was looking for a way to give back and use her skills for a greater purpose when she first heard of the opportunity to go on a TIE exchange. After getting an e-mail from Wieden+Kennedy Head of Planning, Stuart Smith, she immediately responded showing her interest. 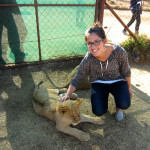 Eleven months later, she was boarding a plane to Pretoria, South Africa. Sam would work with the Clinton Health Access Initiative (part of the Clinton Foundation) and the National Department of Health of South Africa. The incredibly challenging objective was to find a way to help stop spreading HIV from HIV positive mothers to their children, to reduce the rate of new infections of the virus. Why was this so challenging? Because South Africa is the country with the highest HIV infection rate in the world. And the lack of up to date, accessible information didn't really help. What Sam came up with was amazingly simple and powerful. The results of this campaign made a profound difference to CHAI and NDOH's way to communicate with South African mothers and will keep making a difference for several years, improving the lives of thousands of children and unborn babies. After her one-month placement, Sam felt she had renewed her confidence in her personal and professional strengths and developed skills she never knew were there. And most important: she got inspired to think things differently in the industry of communications, to find ways to use her skills for more than just serving clients needs. "TIE opened my eyes to the much, much bigger need out there. And that's is something I will never forget. ", Sam says. To read the full case study, you may click here.